Eating some food items at their specific times is very important to get all their benefits. When eaten at the wrong time, these food items can cause harm to our health in different ways. For eg. eating banana at night can put us at risk of cough and cold, whereas sugar can put us at risk of gaining weight when eaten at night. Below are the 7 foods we eat at wrong hours that are harming our health. Experts claim that the best time to consume milk would be in the night, rather than in the day because it takes a long time to digest and might make you feel lethargic. Drinking milk at night relaxes your body and enables the cells to absorb the nutrients effectively, while you rest. Due to more physical activity in the mornings, milk can become heavy to digest and also mess with your meal timings. Consuming rice for lunch is the perfect time, since your metabolism in the day time is much higher than at night, it gives you ample chance to use up the carbohydrates. Rice should be avoided at night, as they are high in starch content and may leave your stomach with a bloated sensation through the night. 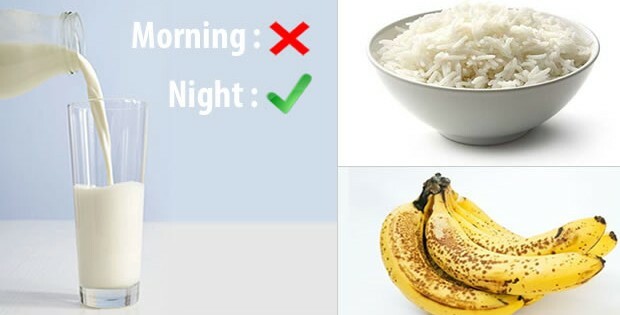 Also, consuming rice at night may promote weight gain, as it takes longer to digest and our body is completely at rest. When eaten in the daytime, curd helps in the digestion process and soothes the digestive system. It is a probiotic food that aid in gut health. Eating curd during the night can badly affect the respiratory tract causing cold and cough and leads to mucus formation. Ice creams, chocolates and every food items that are loaded with sugar, should be consumed in the mornings. This is because our body insulin is more effective in fighting sugar at this time of the day. We are also more active in the day, so our body is able to burn more sugar throughout the day. Consuming sugar at night, will only increase your body fat, since physical activity is also at a low at night time. Pulses and beans are loaded with dietary fibres. When taken at night, they help in digestion and lower the cholesterol levels. They also help you to get a good sleep. Avoid eating fibrous foods such as sprouts, lentils, beans etc. in the morning or during daytime, since it might increase your appetite and cause you to eat more throughout the course of the day. Banana is loaded with fibres that help in the digestion process. Banana also has natural antacids and helps in soothing heartburn. They also keep the energy level high throughout the day. It’s a perfect before workout food too. When eaten at night, banana increases cough and cold and leads to mucus formation. Since banana is very rich in magnesium, if taken on an empty stomach at night, it can lead to stomach troubles. Apple is a rich source of fiber called pectin, especially the apple peel is packed with pectin. Pectin helps to smoothen the bowel function, prevents constipation and and eliminates carcinogens from the body. Apple has a high content of organic acid. When consumed at night, it may cause acid reflux due to the release of the acids, thereby increasing the acid levels.